Iberdrola, the Spanish renewables giant, boasts a global installed capacity of over 29,400 MW, more than 15,800 of which are produced in Spain. 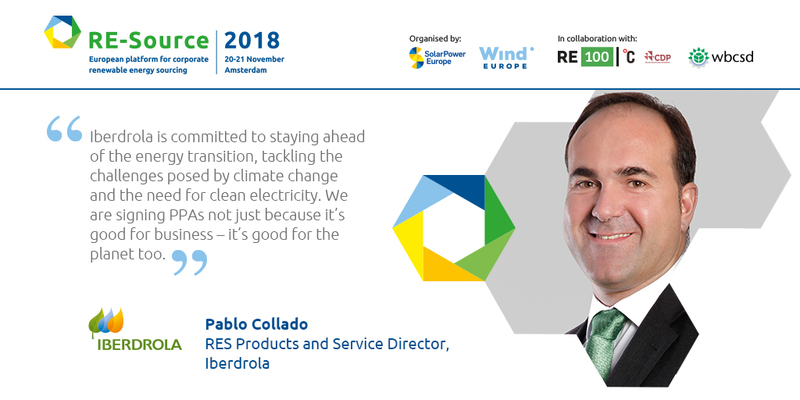 But over the past few years, Iberdrola has expanded its portfolio by striking up long-term power purchase agreements (PPAs) in Spain, the USA and Mexico. So far, Iberdrola has signed PPAs worth over 800 MW with U.S. multinationals. Its corporate clients have included Amazon (a wind farm in North Carolina), Apple (the newly-built solar and wind power plants in Oregon) and Nike and Google (with wind farms in Oregon, Texas and South Dakota). In Mexico, Iberdrola has built wind farms and solar power plants with an installed power of 600 MW supplying energy to private industrial clients through long-term PPAs, as well as the clean energy certificates associated with these facilities. And just last month, Iberdrola signed what is said to be the first PPA signed between a power company and a telecoms operator in Spain. The agreement, settled with Basque Country-based telecoms provider Euskaltel, will supply electricity from a 391 MW solar project. Prior to this, Iberdrola had already signed a 10-year PPA for the solar project with Grupo Kutxabank, in what it claimed to be the first contract in the world of this kind to be signed between an energy company and a bank. After investing more than €95 billion in clean energy over the past 18 years, Iberdrola expects to invest €32 billion by 2022, dedicating 37% to renewable projects.